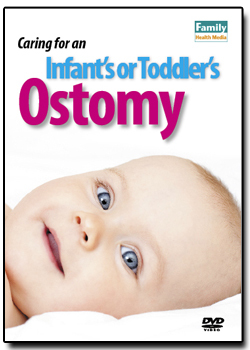 This 17-minute educational DVD is designed for the nurses and family care givers of an infant or toddler with a colostomy. The video explains the basic function of an ostomy, describes the various types of ostomies and demonstrates in step-by-step fashion the procedure for cleaning and changing a one-piece and two-piece appliance. Tips for daily care and problems to watch for are also covered. The video has no commercial bias or product promotions. The information is generic, so all parents and care givers will benefit from the video, regardless of the brand of ostomy appliance used. This educational video is aimed at preparing parents and care providers for the home management of infants with ostomies. Using clear and simple language, live demonstration, photographs, and colorful illustrations, it reviews pathophysiology of various ostomies and explains that the principles of ostomy management are similar regardless of the type of ostomy the infant or child has (vesicostomy, ileostomy, colostomy). The video provides a valuable learning tool for parents and lay caregivers. Additionally, the practical advice that it offers for managing ostomy care in an active infant may make it a good educational resource for nurses training families for discharge who have only limited experience in managing and implementing ostomy care on an active infant or robust toddler. - Review excerpt, NeoNatal Network, Vol.28, No.5, September/October 2009. "The pacing of the presentation is not too fast or too slow, so parents have time to absorb the information without being overwhelmed. Good computer visuals. I liked the way different ostomy types are presented." "Our NICU is a 53-bed unit and we have over 200 nurses on staff for just our area. We have several patients a year with an ostomy (usually an ileostomy) and the video developed by the Family Health Media has been very helpful. The nurses are very visual and have stated that the video has been very Informative to use in conjunction with our unit’s policy and procedure related to ostomy care. The educator and I have started to use the video in our orientation program for the New Grads to the NICU. Our last group of new grads has demonstrated more competence with the care of an infant with an ostomy than some of our more experienced RNs. I believe that the video provided by the Family Health Media has contributed to their level of comfort in that aspect of patient care. I have also utilized the video in two classes for the NICU staff that focused on skin care in the NICU, and, of course, used the video for ostomy care. The staff that attended those classes felt the video was very helpful with the care of the ostomy. The goal is also to utilize the video for the education of a parent with an infant with a stoma. However, at this time the video has not been show to any parent of an infant on this unit. Thank-you for developing such an informative and visual tool that we can use for the education of the nurses and the family of an infant with an ostomy." Associate Professor; Director of Wound Ostomy Continence Program.